Domes are highly effective storage systems, as they not only protect the environment from potentially harmful products, but they also protect the stored commodities from destructive elements such as moisture and condensation. The environmental debates showed that environmental laws should be reinforced or created, to better protect the environment. In many countries, there is an obvious lack of rules regarding where people can store what they want and where they want. Domes help to protect the environment because they are hermetically sealed, insulated and waterproof (Figure 1). Products — such as fertilizers, cement, alumina and fly ash — can be stored easily, protecting the environment, while other materials like sugar and cereals are protected against the environment. To understand how domes can protect the environment and the stored material, it is necessary to know how they are built. The construction process can be described in eight steps (Figure 2). Concrete ring foundation, reinforced with steel. The airform is attached to the exterior of the ring beam. The airform is prefabricated to the dimensions of the building and delivered on site ready to inflate. The airform is inflated and the pressure inside is stabilized. VETHANE foam is sprayed on to the internal face of the air form. 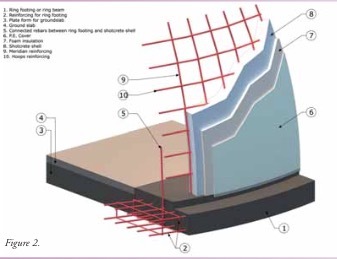 Anchors are embedded in the foam in order to receive the first steel rebars. Steel rebar is fixed along the walls of the structure using the tabs. Concrete is spray applied on the steel grid. Openings, such as doors, ventilation and fill openings are then cut through the structure. Once the airform is inflated, all the work is carried out inside the dome. Consequently, the stored products are unaffected by exterior environmental factors such as rain, wind, and daylight. Domes minimize floor space while optimizing the volume. This means lower cost per ton of storage. Domes are the ideal solution for the storage of bulk materials that are sensitive to temperature and humidity. The application of Vethane foam on the inner surface of the airform gives the dome the quality of being equivalent to a controlled atmosphere chamber. Condensation is practically eliminated inside the dome since the insulation of the dome will conserve a stable ambient temperature. The whole of the structure itself is perfectly adapted to the techniques of prolonged conservation of perishable products. A PVC membrane forms the exterior layer of our dome and acts as the initial framework for the application of Vethane foam and shotcrete. Opposite to what is usually done in traditional construction, waterproofing is controlled at the very beginning of our process, once the airform is inflated. This membrane, added to the Vethane foam, assures that water will never leak inside the dome and spoil the product. Concrete domes have proven their efficiency to protect the environment and products against temperature and humidity. The filling and reclaim system, including operation and maintenance, are usually cheaper for the domes than other solutions. There are other things that must be considered: the cost of the land, especially in a port (Figure 1) knowing that the domes will use less space than flat storage, for example. The time of execution can save financial cost and the operation can start earlier. Domes are an innovative solution that are capable of bringing advantages in terms of product conservation, insulation, operation and maintenance costs. As a storage solution, they can help ensure maximum waterproofing and are a strong and durable solution to storage.